The festivals are the highlights of the village calendar, eagerly anticipated by the hundreds and thousands who come from around the country and from around the world. They are a time of spiritual renewal for each and every member of the village shrine, including even the Chief Priest. Everyone gives an account of their activities over the past year and receive their blessings for good health and success in the coming years. They are joyous occasions with much ceremonial dancing, drumming and feasting, and disputes between families, friends, co-workers, etc., are resolved at this time. The priests and the chiefs play central roles leading the processions and conducting the rituals. The main festival is held at Easter but a second festival takes place in October for those who cannot make it for the main festival. Attendance at the smaller festival is not limited to only those who missed the main festival; many come to both. The festivals are also a time when many people join the Apetorku shrine. By far the biggest festival of the year is the Easter festival. 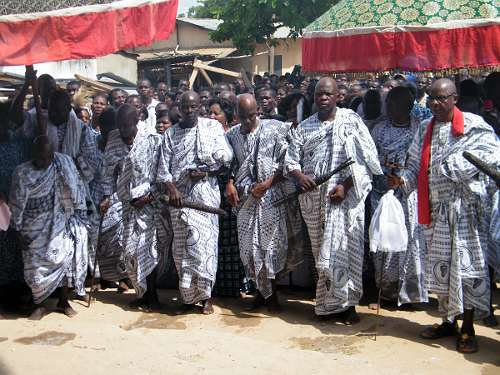 Villagers and members of the shrine celebrate for nine days beginning the day before Easter Sunday, and running through to the following Sunday. On Easter Sunday, a procession of the priests winds slowly toward the shrine, and is followed by rituals performed with more than 1000 adherents in attendance. The following days are confessional days when members make their annual public confessions and offerings to the shrine, and by so doing they reconfirm their connection to the shrine. The last day of the festival, the second Sunday, is another day of rituals and communion at the shrine. Throughout the festival there is almost non-stop singing, drumming and dancing. 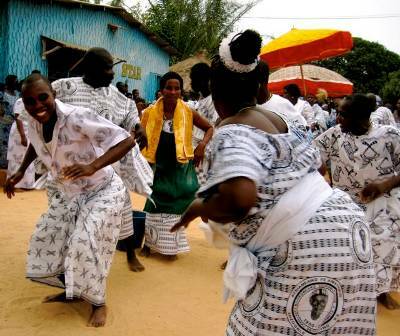 To promote harmony, guests representing different Ewe regions of Ghana, Togo and Benin are invited to observe and participate in the festivities. Although the festival is held during the holiest week of the Christian calendar there is no special significance to the timing. In theory the festival could be held at any time of the year, but long ago the shrine elders decided to hold the festival at Easter for consistency and because it is a convenient time for those with white-collar jobs to take leave to attend the festival. Below is a report on the 2012 Easter festival by video journalist David Ato of Metro TV News. In the video shrine elder Kwasi Dunyo speaks on how the festival promotes togetherness and is a time for people to confirm their spiritual connection to the shrine. Later, Chief Torgbui Klu Agudzeamegah II talks about the unity of the village and how it spurs many to support the community through community projects that benefit all the people. This is a shorter version of the Easter festival, lasting just two days. Held on the last weekend in October, it is an opportunity for shrine members to make their annual public confessions and offerings if they cannot come at Easter. The priests lead a procession to the shrine on Sunday which is followed by rituals, confessions and offerings. Not as many people attend, and there are no invited guests from other regional Ewe groups as there at Easter.